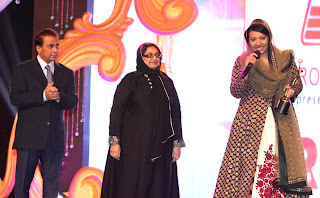 Shafeena Yusuffali, CEO of Tablez Food Company, received the Young entrepreneur Award from Sharwa Abdul Razak and legendary Cricketer Sunil Gavaskar during the "Gr8 Women Awards 2012 Ceremony" held at Atlantis Hotel in Dubai yesterday. Other award winners included HE Dr. Sheikha Hind Al Qassimi, Vidya Balan, Sushmita Sen, Asha Parekh, Poonam Dhillon. It is 12th year this award function is being held which recognises women achievers in various fields for their excellence & achievements. Shafeena Yusuffali launched her company last year and has started many trend setting restaurants such as PEPPERMILL, De Thali, Tanjara and the boutique cupcake concept "BLOOMSBURRYS". All the ventures are already very popular and Shafeena is all set to expand her business into new markets in GCC and India very soon.